Outside the halls of local media outlets, there are people who actually like Dayton. Phil Herzing was living in NY looking for a place to move to build his business in Ohio, and after comparing all the major cities he decided on Dayton. Once here, he was amazed to hear the lack of pride displayed by the locals. Phil decided to do something to battle the negativity- by teaming up with Exit Row Productions he started filming short segments on Dayton businesses and why they love Dayton. He’s put these videos up at www.daytonbusinessspotlight.com and has been producing about 2-3 videos per week. Now before you go all pessimistic Daytonian on him- no, he’s not charging to do these, he does them for free. Now, if only the local media would get a hint. Yes, there are people who like Dayton- actually living in Dayton. The city that Dayton should take after Omaha NE, a city that takes pride in itself, but is not arrogant. Omaha may not be perfect, but they are who they are and they have a nice, thriving, clean DT that attracts all sorts of people, including the beloved suburbanites. That is the thing with Omaha, you don’t get the feeling it is urban vs suburban. They are country folk who respect the city, and the urbanites understand their place with the suburbanites and farmers. Go figure. Finally! I’m sorry if I offend anyone, but having been born and raised here, I love Dayton and there is nowhere else I would rather be. I’ll be checking out that site later. Thanks, David! If you love Dayton you will mention, in no particular order……..
Wow, thanks for the information, David. And Phil, great work, looking forward to your next feature. Solid video, I forgot to mention. No planes or mention of brothers or hats or wannabe athletes or blue collar this and that. Dayton looked……… innovative yet still real. Thank you Mr. Herzing! Will be sending you some link love myself. Don’t confuse my love of my hometown with full acceptance of all of the issues the city has. Changes in city government can’t come soon enough for me. Yeah Ice Bandit, but we had the Wright Brothers………..!!!! Thanks David, for the reminder that one person can make a difference and for identifying Phil as one who is leading the way with conviction. 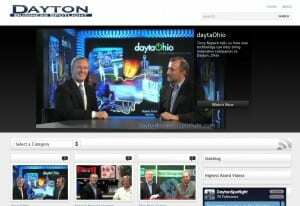 Dayton IS a great place to work and live! one thing i love about louisville is how much people from louisville love louisville. love, in the real and true meaning of the word. we are a fiercely loyal and proud people: if all of the tattoo shops in town offered free fleur-de-lis on the fourth of july – and they should – there would be 10,000 takers. there are precious few places like louisville left in america in this regard – places where the people are spiritually tied to the land by their collective memory of the best and worst of times there: new york and new orleans; pittsburgh – towns where you can wake from a bad dream in the middle of the night and talk about it with your bartender at 3am; the kind of places where when asked, “where ya from?” you answer, “i live in washington (or california, or texas) but im from louisville, kentucky,” even when you havent lived here for 20 years. . .
a wise man one said, “if you were alone, you could walk away from louisville.” but as long as you love louisville, youll never be alone.